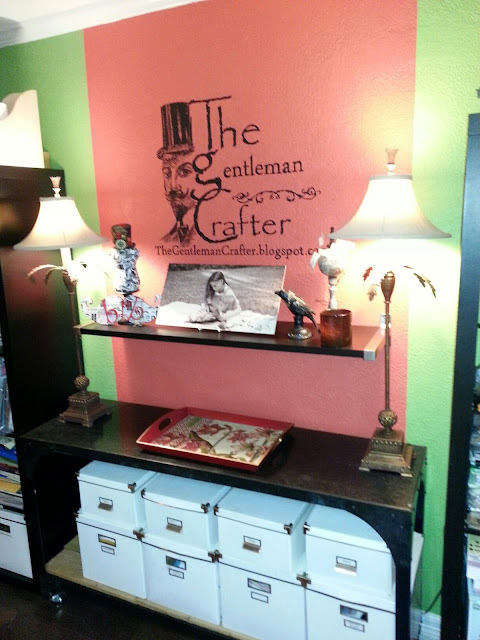 The Gentleman Crafter: Studio Almost Done! Just wanted to pop in and invite you to come by the Ustream Show tonight! It's Take Out Tuesday at 7:00 p.m.! Tonight, just some chat and I'll give you a tour of my new hopefully improved studio. It's not all done yet, but you know...it's at least back to functioning order. I might be able to start creating again! Yahooo..
Jim it's breathtakingly gorgeous! The floors are beautiful and the colours are gorgeous. So fresh, vibrant and definitely a room that inspires creativity. Well done! Oh wow...it looks great....those shelves really worked out good, huh :-) :-) :-)!! Looks fantastic! Of course you are going to have to share the info about the shelves. What kind and where did you get them? I love the "wall o'punches"! And the color really does look nice. The floors are ahhhhmazing. I have hardwood in my studio and was at first worried that I'd trash them. But so far so good! 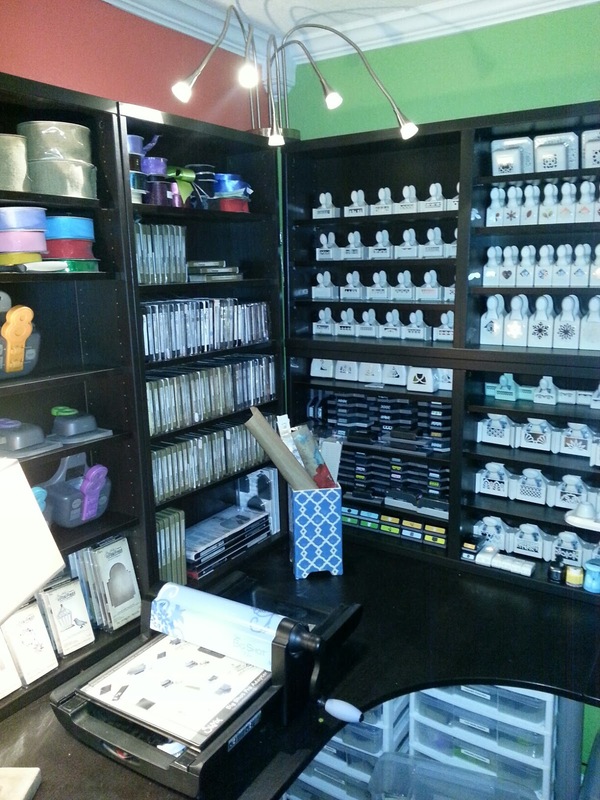 Jim, Your craft room is awesome! The colours are so fresh, the logo on the wall gives a touch of class & the amount of crafty products is incredible. WOW!! You have been BUSY!!! I know you're happy having your "therapy" room back!!! Can't wait to see the rest of it tonight. The new shelves look like they are perfect!! studio fit for a scrappin' king...looks amazing, Jim! Great job!! Looks wonderful! Can't wait for the tour. This is great! Looking forward to seeing all the details tonight. Wowzers...Your studio looks wonderful. So light and airy. looks amazing! I want to come over to play!! I so hope you recorded! I had a board meeting so had to miss the show. I really want to see it though. I have to tell you Jim, when I first saw the lime colored wall I thought you'd gone off the deep end and that it was going to look awful. Let me apologize! I love, love the colors you have put together for your walls and the character drawing of you is amazing! Your new studio is like a breath of fresh air. I love it! When I get my studio will you help me pick the colors for my walls? LOL!!! Wow! 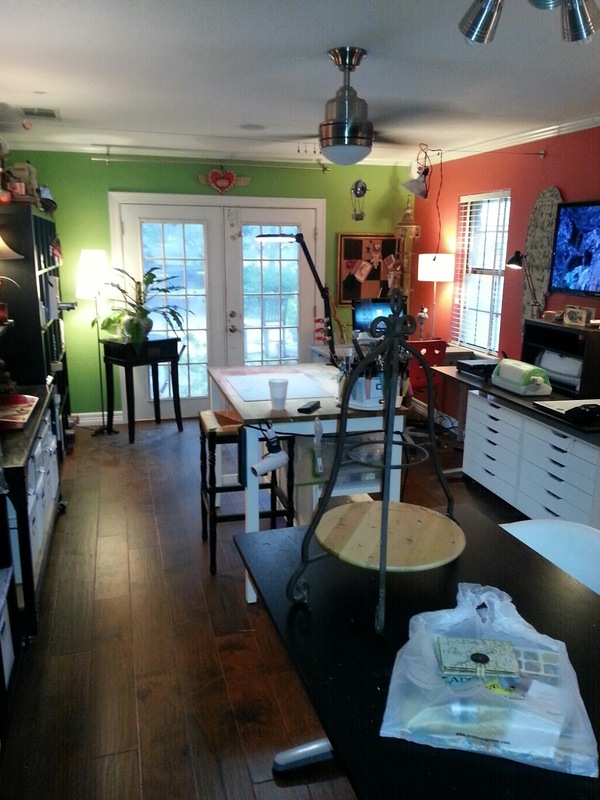 What a great studio....great natural light pouring in too! I love the sunshine! Hope your healing well and thanks for sharing! accidents lead to new opportunities! great job! love it love it love it! It is gorgeous and I know you'll CREATE some wonderful projects. Put on your bucket list to call lighting specialist in Austin to come out and design the best lighting for your artistic studio. You'll be so happy. Look forward to your future creations. Hate that I missed that UStream....the studio is fabulous! What a happy spot for creativity! Enjoy! Wow! Wow!! WOW!!! How wonderful for you to such a happy, colorful spot to create in! Love the space! Isn't it wonderful to have everything at arms length? Congratulations to you! 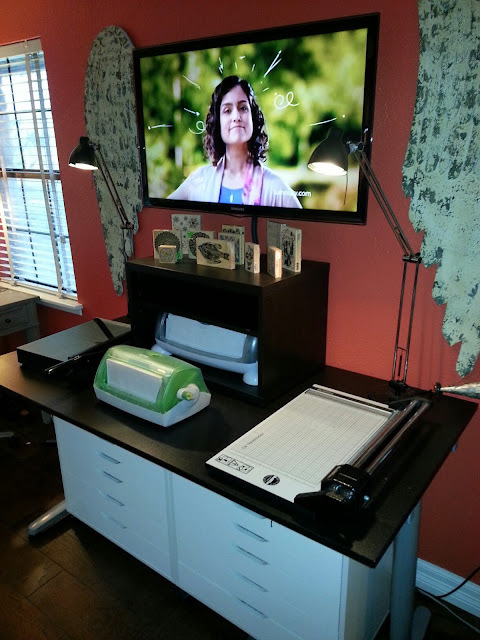 One question- Is that a paper cutter next to your Cuttlebug? What kind of paper cutter is that-and what size is it- I would love one! Wowzer! Love the new studio look. wow i am jealous. What a great studio. It looks mahvelous, Jim! And I didn't know you had a punch problem. Great collection!! Wow, wow, wow...i love your creative space and no wonder you love to play in there so much...can't wait to see what new and exciting things you come up with...thanks for sharing. What an incredible space. If I have a flood, will my space come back looking like yours? Seriously, it is a great space. Can't wait to see what you come up with creatively once you are healthy again. More, more, more pictures. Every detail. Wow! Your new studio looks amazing!! I know that it was a hassle with all the moving and doing without for a little while but it sure looks like it was well worth the wait!! Enjoy and can't wait to see what your going to create in your newly inspiring workshop!! So glad your back!! !